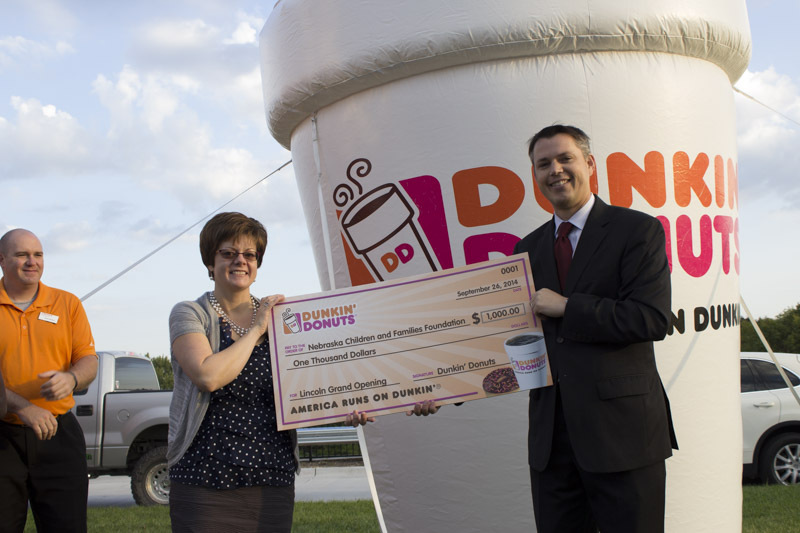 Home › Cradle to career › Nebraska Children raises $1,900+ at Dunkin’ Donuts grand opening! Nebraska Children raises $1,900+ at Dunkin’ Donuts grand opening! Kelly Medwick, Nebraska Children’s Chief of Staff accepting a donation from Bryce Bares. Two great things happened today. First, Lincoln got its first Dunkin’ Donuts store at 27th and Old Cheney, giving our capital city access to some dynamite coffee and treats. To make things even better, the store’s owner, Bryce Bares of Omaha, selected Nebraska Children to be his charitable partner for the grand opening. He donated $1,000 to Nebraska Children, and gave free coffee and mugs to customers who made donations too. By the end of the morning, we had raised nearly $2,000. Q: Why did you choose Nebraska Children to receive donations during the Lincoln Dunkin Donuts grand opening? A: My wife and I are both working parents, and we struggled to find quality childcare even though we were blessed with the resources to afford good care. 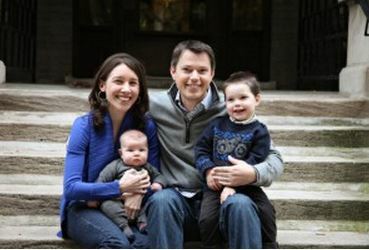 The challenges to single parents can be even more overwhelming. NCFF’s work helping to provide vulnerable children with opportunities (crade to career) is unbelievably important. A: Serious disparity of opportunity exists for children depending on where they live, income and education level of the parents, and quality of the school district. It is very difficult for a child to focus on education when external challenges like hunger, violence, poverty and neglect redirect their attention. A: Aside from the obvious answers, like improved education, teaching fundamental skills – time management, basic financial literacy, employer expectations – is invaluable to the business community. The more the children understand employer needs (reliability, integrity, work ethic), the more successful they will be. A: All Children should have access to quality education that reaches beyond the traditional classes (English, Math, etc.) and prepares them for a successful career. We need to work hard to offset the disparities and challenges faced by at-risk or vulnerable youth. By providing resources to organizations like Nebraska Children, at least we are taking a step in the right direction.